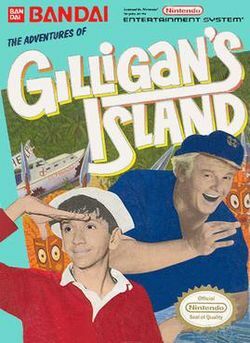 The Adventures of Gilligan's Island (known on the title screen simply as Gilligan's Island) is a single player NES game by Bandai that is based on the 1960s sitcom Gilligan's Island. It was released exclusive in North America in July, 1990. The player controls the Skipper and is followed around by Gilligan, who is controlled by the computer. The game's four levels are dotted with threats from creatures in addition to headhunters and the surrounding terrain. Player have to wander around the island, collecting various objects, speaking with the other castaways (the millionaire, his wife, the Professor, and Mary Ann) and solving various puzzles. Players most also frequently rescue Gilligan, who frequently gets stuck in things, the player has to cut him free or rescue him if he falls down one of many holes. The game has a password feature for each level. Enemies deplete the player's life bar and there is also a time limit for each level. The Skipper can attack most of the game's enemies with a punch. There are four bosses in the game (a gorilla, a large cannibal who is the leader of the headhunters, and a skeleton). This page was last edited on 5 April 2016, at 06:39.